مارك زوكربيرج الرئيس التنفيذي للفيسبوك كان ذكر الشهر الماضي إنهم يعملوا على إضافة شئ جديد للشبكة الإجتماعية يساعد المستخدمين في التعاطف مع الأحداث. اليوم ظهرت تقارير جديدة تذكر أن الفيسبوك ستبدأ إختبار ميزة جديدة تُدعى ردود الافعال أو reactions هذه الميزة سيتم إضافتها مع زرار الـ Like حيث عندما يضغط عليه المستخدمين ستظهر لهم وجوه تعبيرية بجانب زرار الـ Like هذه الوجوه التعبيرية تستطيع التعبير عن رد فعلك. عندما تضغط على زرار Like ستظهر لك وجوه تعبيرية مثل قلب أو وجه تعبيري ضاحك أو حزين أو مصدوم أو غاضب او يبكي وستظهر هذه الوجوه التعبيرية بعد إختيار اي منها أسفل المشاركة بجانب زرار الـ Like. هذه الميزة سيتم إختبارها على عدد من مستخدمي الفيسبوك في أسبانيا وأيرلندا أستعداداً لتفعيلها عند كل المستخدمين حول العالم. Today were launching a test of Reactions -- a more expressive Like button. The Like button has been a part of Facebook for a long time. Billions of Likes are made every day, and Liking things is a simple way to express yourself.For many years though, people have asked us to add a "dislike" button. Not every moment is a good moment, and sometimes you just want a way to express empathy. These are important moments where you need the power to share more than ever, and a Like might not be the best way to express yourself.At a recent Townhall Q&A, I shared with our community that weve spent a lot of time thinking about the best way to give you better options for expressing yourself, while keeping the experience simple and respectful. Today were starting to test this.Reactions gives you new ways to express love, awe, humor and sadness. Its not a dislike button, but it does give you the power to easily express sorrow and empathy -- in addition to delight and warmth. 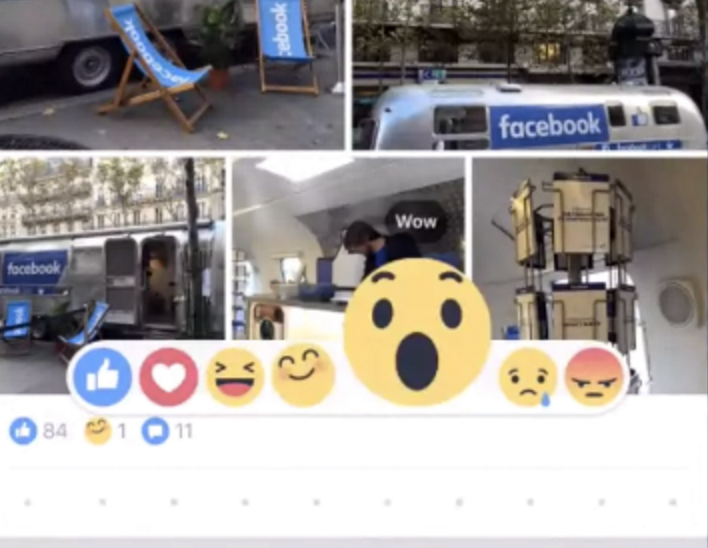 You’ll be able to express these reactions by long pressing or hovering over the Like button. We’re starting to test Reactions in Ireland and Spain and will learn from this before we bring the experience to everyone. We hope you like this – or can better express how you’re feeling!